This year I’ve learnt two new things about Christmas I didn’t know before. Actually it’s ONE thing I’ve learnt this year, the other I got wind of last year from my barber at Super Cuts before I started “doing my own hair” thanks to a $25 Wahl Clipper Set. 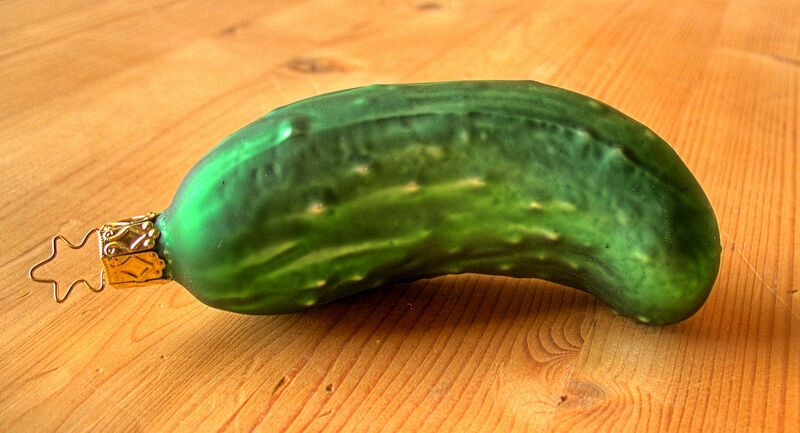 Allegedly there’s a German Christmas tradition called the Christmas Gherkin (pictured above). It’s a bauble used to decorate the Christmas tree and hides in plain sight because it’s green. Whoever spots the gherkin gets an extra present. Three sizes are available, with the smallest one being the most difficult to spot. Readers in the UK or Europe may not have heard of this tradition which is known in the US as a German Christmas Tradition. I’ve spent many a Christmas in Germany and let me assure you we’ve never heard of it in Germany! In Germany and large parts of Europe we celebrate Christmas on the 24th (Christmas Eve), followed by two bank holidays which we simply call the first and second Christmas Day. It’s a three day affair, even though most shops nowadays are open on Christmas Eve for last minute shopping. Present unwrapping begins in the evening on the 24th. That’s different in the UK and Commonwealth countries, where Christmas Eve is basically nothing and totally ignored, followed by the two-day Christmas affair consisting of Christmas Day and Boxing Day. In essence, when I moved to the UK back in 1999 I lost a holiday. Now that I live in the US it seems I’ve lost another one: because over here there is no Boxing Day. The 26th is the same as the 24th, namely nothing and completely ignored – at least according to the calendar. There’s still plenty of Christmas cheer and holidays over here of course, but those are voluntary and not bank holidays. This is probably due to Thanksgiving which has just finished a few weeks before Christmas, and that IS a major event and a bank holiday in the US – while completely ignored in other parts of the world. Associated with Thanksgiving on a Retail Mayhem level are Black Friday and Cyber Monday, a major sales event that’s comparable in madness and price reductions to the Boxing Day Sales.